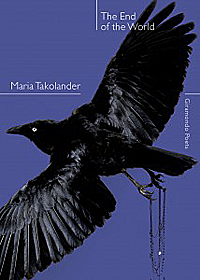 After reading Maria Takolander's poems for several consecutive nights, I dreamt of dark forests, dense with silence and snow, infiltrated by traces of implacable ancestries, legible only to the initiated. Versions of this primordial landscape, attenuated to dream state or looming insistently in the consciousness, form a psychogeographical subtext to poems in the first two sections of "The End of the World": an otherness grappled with but also owned, internalised - encountered and confronted and demystified, yet never entirely purged of the dark realities that lurk in its depths, for in these poems the past is very much alive, and it is a sombre place. to the light of a fire on his skin. this glorious violence upon you and me. In the Author's Note to "The End of the World", Takolander describes childbearing as "an experience of estrangement as much as wonder, which powerfully evoked for me the primordial past of the human species." At the end, alone, each of us felt raped by ghosts. Personal histories intersect and interface with larger narratives, often to the detriment of the former, although in Stalin's case to the detriment of both. The grim roll call of "Missing in Action" is a case in point. This poem, delivered as if to the monotonous beat of a drum commemorating the fallen, extends this theme into the truncated lives of previous generations of the poet's family, exiled by Stalinist persecution from their Karelian homeland in Eastern Finland. the chimney opens itself to the stars' alien light. Several texts: "Convicts", the ironically titled "White Australia", and "Eliza's Shipwreck", recreate scenes from Australian history since 1788. These are followed by a series that reprises the collection's title - "The End of the World" - by alluding to geographical limits, in this case "somewhere in Patagonia", in spaces "vacant as dreams": "Dogs in Space"; "The End of the World"; "Punta Arenas, Chile"; "Cusco"; "Buenos Aires". The more expansive structure of the first three of these texts anticipates the forms of some of the longer poems and prose poems of the third and final section, which, like the first two, is untitled. Here, the poet's forensic mind and eye delve into some of the strange ideas that shaped past perceptions of "reality", referencing "a medieval and misogynistic tract", the "Malleus Maleficarum", also known as "The Hammer of Witches"; Max Nordau's "Degeneration" (1892); and Cesare Lombroso's "After Criminal Man" (1876) and "The Female Offender" (1893). Samples of the pathological are displayed in texts such as the four-part "Cesare Lombroso, Criminal Anthropologist" that opens the final part of the collection, and the satirical "Degeneration". There follow some trenchant and ironic studies of bleaker aspects of the human (and inhuman) condition, including "Charcot's Patients"; "Golden Sigi: An Advertisement" (ostensibly for Freud); the grisly "Show Business", and the chilling "Witch". The collection concludes with four pieces in a succinct style reminiscent of fable: "Loneliness"; "Violence"; "The Ashes"; "The Gamble". Throughout the collection, the poet displays a technical deftness and range of poetic form perfectly judged for the purpose of each text. Stanza forms range from the spare distich of "Anaesthetic" and "Chimney", through the tristich favoured in "Missing in Action", the quatrains of "White Australia", "Charcot's Patients", and the intricate, imbricated stanza forms employed in many shorter and longer poems ("Utopia"; "The End of the World") to more expansive, less obviously structured forms which are nonetheless unerringly suited to their purpose ("Dogs in Space", "Show Business", "Witch"). Sequences of poems sometimes deploy several stanza forms ("Post-partum"; "Cesare Lombroso, Criminal Anthropologist"). The arresting choice of language, the precision that has guided those choices, will be apparent from the foregoing quotes, as is the clarity she brings to bear on complex subject matter, without compromising the complexity or gravity of her ideas. On the contrary, her skill sets those ideas on a razor's edge. Takolander's structuring of individual poems and the collection as a whole and in its parts strikes me as both subtle and immaculate. In Takolander's words, "The past is fascinating to me because its strange stories clearly reveal how far we live from reality at any given time. The stories we tell now are no less strange, although they might be more familiar.... we have constructed rich, fanciful and sometimes pathological cultural worlds for ourselves in which we find meaning but also entrapment. The poems in this collection attempt to see through those myths - particularly those that have emerged around childbearing and childhood, national identity, and scientific and other "knowledges" - and to see reality as baldly and as boldly as I can." and so careless as to be happy?